If your coordinator allows you to use the Tradeboard, you will see Trades in the top menu and on your Welcome page. 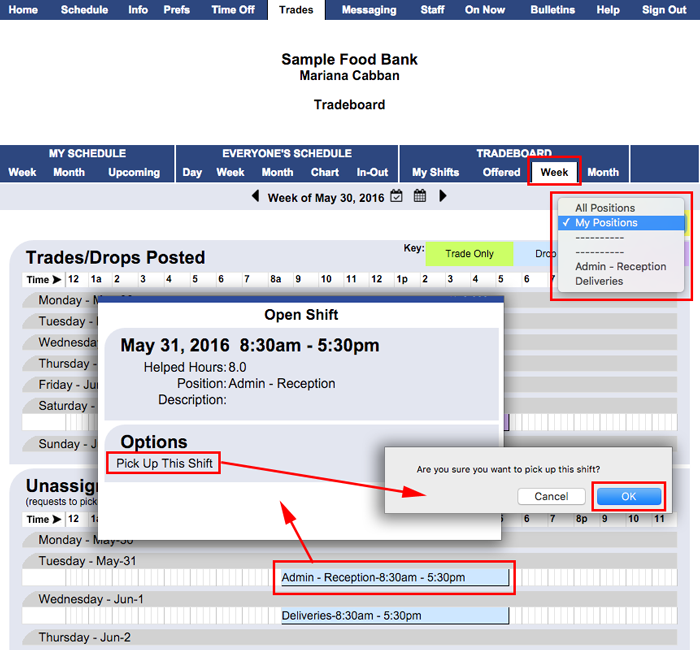 The Tradeboard allows you to trade shifts with other willing helpers - (your trades may require coordinator approval before they are final). When you click a shift in the schedule, or on the Tradeboard, that you are qualified and available to help, you will see the Propose a Trade link. If you want to propose a trade of one of your shifts, click that shift link to send the offer to the other helper for their approval. If your coordinator allows you to trade "At Will," the trade goes into effect when the other helper accepts the offer. Your organization may require that the coordinator approves trades before they become official and you will receive notification of the coordinator's decision on the trade. If you have requested a shift or to pick up an unassigned shift and your coordinator has not yet made a decision, you can cancel the request. Always check your latest schedule online so you know exactly when you are scheduled to help!